Congrats to James, the first person to succesfully evade my general “plush” rule and get this on the main site, instead of in miscellany. There’s just too much win in here. Made using icanhascheezburger’s builder, though AFAIK it wasn’t actually posted over there. Oh sure, I figured the actual image had been used, just not this particular macro. The link target to icanhascheezburger is messed up. the link url takes you to icanhascheezeburger.com (with an extra “e” in it), which appears to be a food-related site. So it does, thanks. Fixed now. 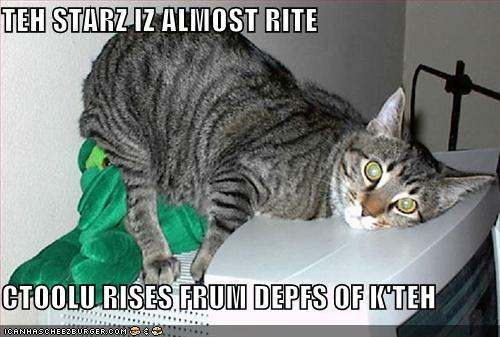 So this wasn’t meant to be Cthulhu-related, it was a normal lolcat? This image has just taken a dark turn, there’s a plush Cthulhu under the cat. Well, the original picture was just in icanhascheezburger’s lolcat builder, so the source image wasn’t lolthulhu-specific. This particular macro (with this caption) was, as far as I know, only submitted here, though.